In 2004, Malcolm Fraser designated the University of Melbourne as the official custodian of his personal papers. Since that time, the collection has grown to over 200 shelf metres of material, spanning his family history, his political career and his active post-parliamentary years. Indeed, the earliest document is the copy of the Australian Constitution given to his grandfather Simon Fraser on his election to the first Australian Senate in 1901. 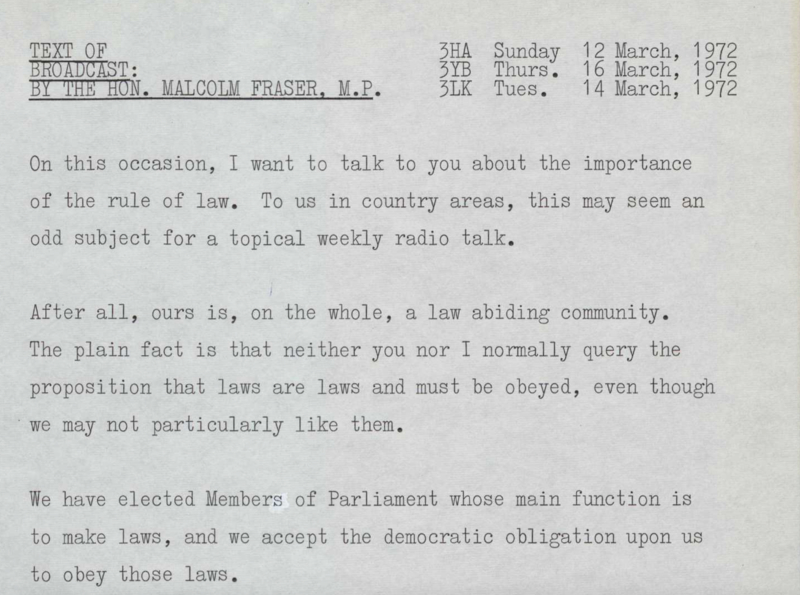 Malcolm Fraser’s personal papers date from his earliest correspondence to his parents at the age of 10, school reports and essays from his days at Oxford, through to papers dating up to 2015. His political papers include correspondence and other papers from his years as Opposition Leader (including the 1975 events), electorate correspondence, regular weekly radio talks, and Liberal Party material. After his retirement from Parliament, the papers document his involvement in the moves to dismantle apartheid in South Africa, his interest in international humanitarian law, his work with CARE Australia and CARE International and his advocacy of the rights of asylum seekers. Thousands of family and political photographs add richness to this remarkable collection. The collection is for the most part open access and complements the official Commonwealth papers held at the National Archives of Australia. 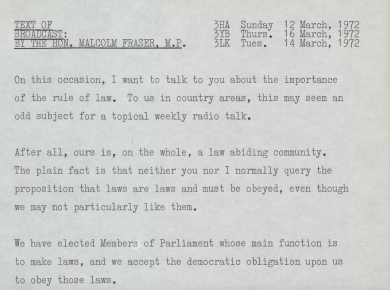 The collection website includes further information on Fraser’s career, including a timeline and subject guides, as well as online resources such as speeches, articles and photographs. The collection contains paper, photographs, objects, ephemera, framed items, digitised items (not born-digital). The collection holds access to copies of av (home movies), the originals are held at the NFSA and they control use for publication.